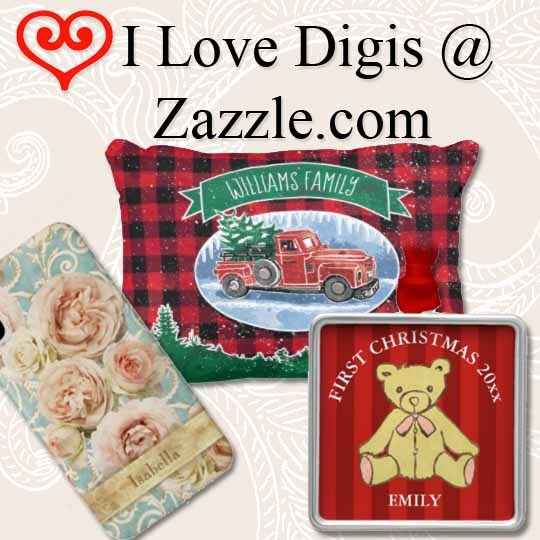 I Love Digis has expanded it’s item line to include our orginal art on physical products at our I Love Digis Shop @ zazzle.com. Zazzle is a print on demand company of a diverse offering of products sold around the world. Many of our products may be personalized to add names and more. 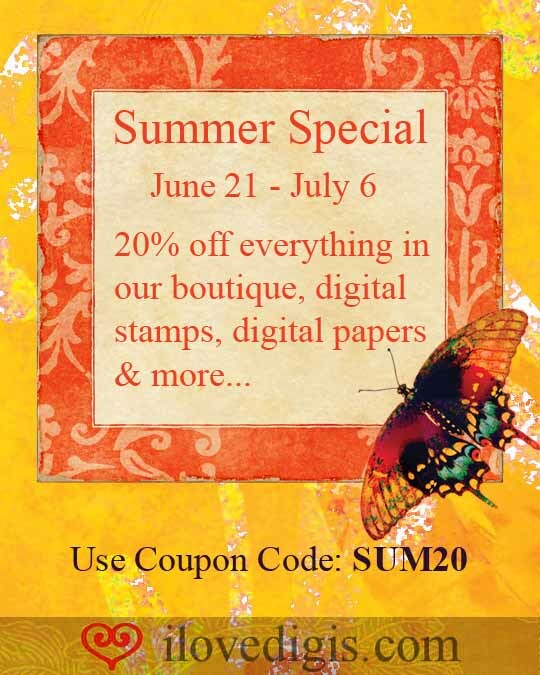 From wedding invitations, apparel, housewares to paper products and crafting items, there is something for everyone. We keep adding items all the time so check back often! Here is another fun project by Christina Betts. Create your own journal notebook featuring cute spiders, skulls and more from our Halloween Hocus Pocus and Thriller collections. Have fun and Happy Halloween everyone! Featuring the Black Cat stamps and candies and more from our Hocus Pocus Collection , this Halloween Pocket Letter design by Christina Betts will get you ready for Halloween! Christina Betts has out done herself again! She combined several designs from the American Denim Collection, Fractal Art Digital Bottle Caps, Spring Daisies Collection, Cutie Pop Repeat Patters #1-8 and Girlie Pop Stamp! A bright and fun design for this Mini Flip Book! Thank you Christina! They’re simply gorgeous… these romantic cards by Karen Stowell using the Flutterby Repeat Pattern #1-8 from the Flutterby Everyday collection by Tim Coffey at ilovedigis.com. Awesome job, Karen! In these two beach themed projects Karen’s baby granddaughter is the star surrounded by star fish and sea shells from our Silly Pop collection. Hot Summer days are upon us and this is the perfect compliment to those beach photos you’ll soon be collecting. The repeat patterns used are: Silly Pop Repeat Pattern #41 Starfish B&W and Silly Pop Repeat Pattern #42 Seashells B&W. So get out those markers and paintbrushes and have fun creating your own unique art for those beach photo layouts! Great job as always Karen, love it! Spring has arrived and so has our Flutterby Collection by artist Tim Coffey. We have one for each season.. Spring, Summer, Fall, and Winter. 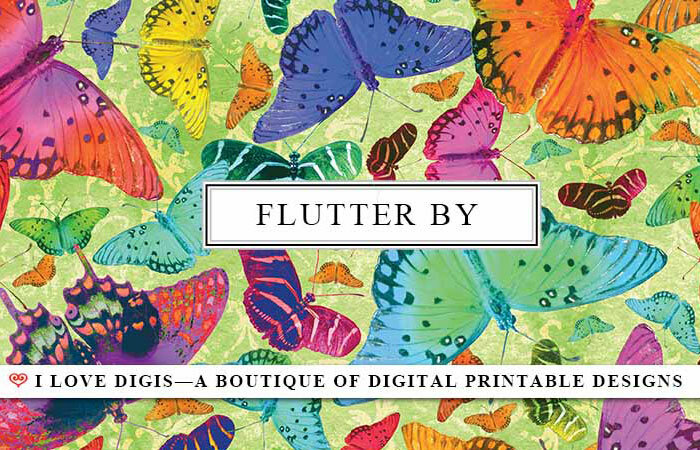 For all you crafters who love butterflies, come take a look @ ilovedigis.com. Let your creativity take flight!